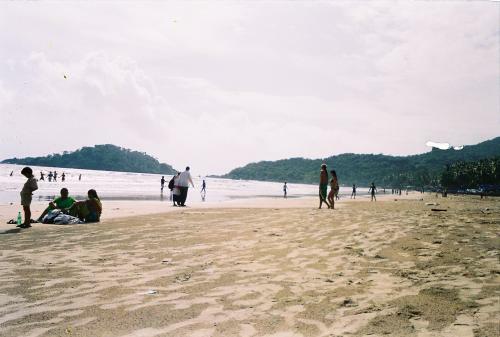 So now been back in Palolem for almost a week, and it's now my last day before I go back to the convent. Its been a nice week with rain only 50% of the time so have managed to top up my tan. Still think will have disappeared by november though. Christ still can't believe it's that far off. Anyway had three- yes three!!! sober days when first back to Palolem. It's really bizarre because the local governer decided to clamp down on all the buisness's opening before their licence started so they came in and bulldosed half the town- no exaggeration. Literally the all got a letter during the day that said you have till 6am to empty out all illegal structures and then the bulldosers coming. Can you imagine a whole bunch of hippys and travellers standing awestruck on a picture perfect beach surrounded by dogs and cows and holding their rucksacks as they watch their cute little bamboo hut bulldosed. India is bloody insane. I mean I wasn't here when it all happened but I've been chatting with the locals about it. It's really sad a lot of people took out bank loans to built huts and restaurants and now they're just gone with no way to pay the loans. Yet there's no sense of despair or giving up here. Everyone is now getting the licences to rebuild and the town is a hive of activety. See they can only have 6month licences but because tourists are coming earlier in the year they tried to get away with opening earlier. Em- even our little mouse hut has gone. Saw AJ yesterday who said alexandra went aswell. But they're rebuilding now. All this has also changed the dynamics of going out here. Well I was doing my 3 days off anyway but then there was Mahatma Ghandis birthday when no one drinks 2 days ago. It was the oddest feeling to be in a pub with no one drinking. Like being in some rehab clinic (yes can hear jokes about thats where I should be.) Anyway then back to normal day before yesterday. Great night out which ended in tressillian style everyone in my room drinking wine, putting the world to rites, arguing about religion and martin jamming with his guitar doing the name a song any song (Ben!!) Oh yeah the guys I met in Baga did come down to join me. Which was really cool, they're a little calmer than Gaz and Dave and very much your typical english lads, but nice with it. Then last night was awesome. Out for a meal guy comes and invites us to a party on the beach. Imagine this picture. Gorgeous beach lite by almost full moon, stars out, sitting in the palm trees with bonfire in the middle chatting with people from all over the world, drinking wine and listening to music. It was stunning. Met yet some more english guys, this lot also from london and strangely also engineers or in advertising. Okay enough of me rambling (and I do realise this is a really rambly entry have to blame to many vodkas last night) off to have my last night in Goa (sniff, sniff) although part of me (mostly my liver) is looking forward to the convent. Going to be a mission of a night to see everyone and already behind.